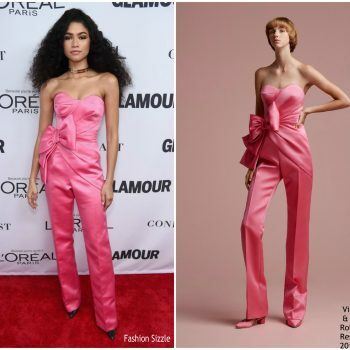 Zendaya Coleman attended Vanity Fair and LancÃ´me Toast Women In Hollywood on February 21, 2019 in West Hollywood, California. 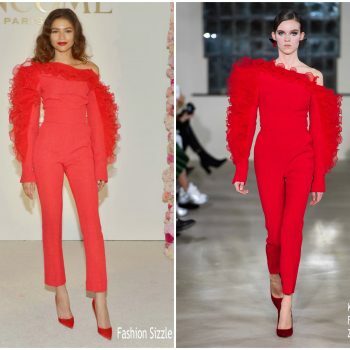 She wore a red Alexis Mabille Spring 2019 Haute Couture gown. 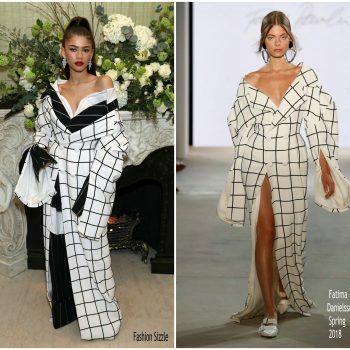 Zendaya Coleman was unveiled as the latest Lancôme ambassador at an event held Four Seasons Los Angeles on Thursday (February 21), California. 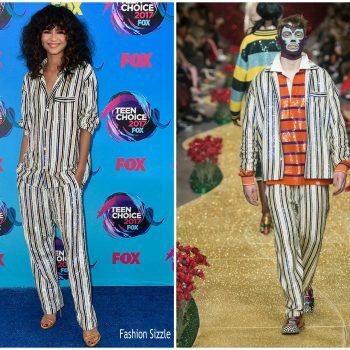 She wore @ David Koma Fall 2019 jumpsuit. 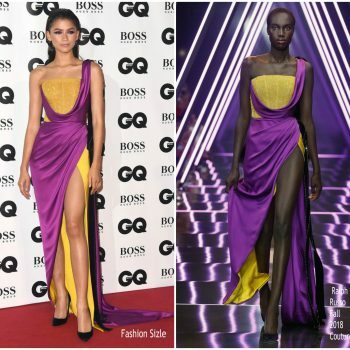 Zendaya wore a Ralph and Russo Fall 2018 Couture purple + yellow draped gown with crystal chainmail, velvet ribbon and silver xilion detail to the 2018 GQ Men of the Year Awards in London. Zendaya Coleman for Marie Claire September 2018 Photographed by Thomas Whiteside and interviewed by Janet Mock. 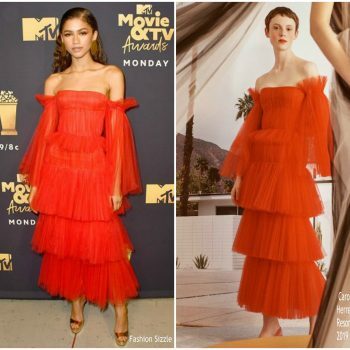 Zendaya Coleman wore a Carolina Herrera Resort 2019 poppy red tiered dress to the 2018 MTV Movie & TV Awards. 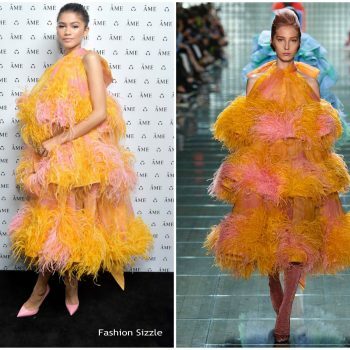 Zendaya Coleman was in attendance at the 2018 MTV Movie And TV Awards on Saturday (June 16) in Santa Monica, California. 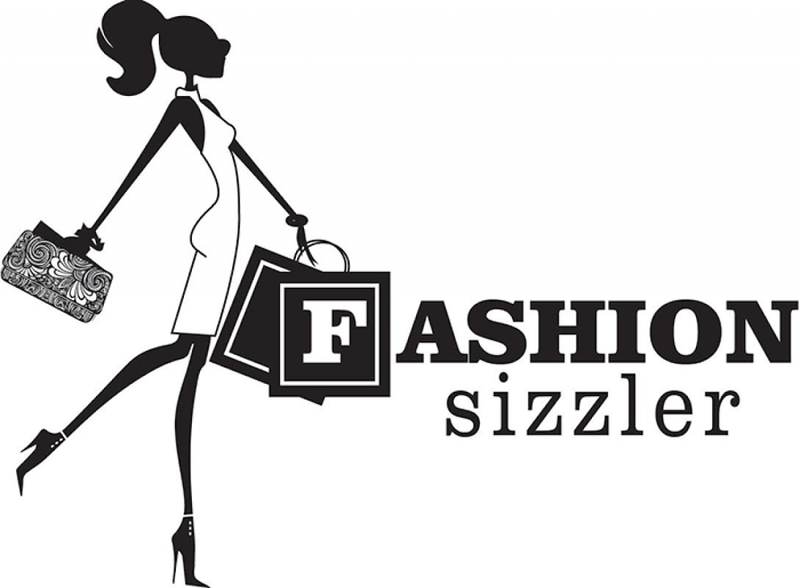 She wore a halter brown August Getty Atelier leather dress. 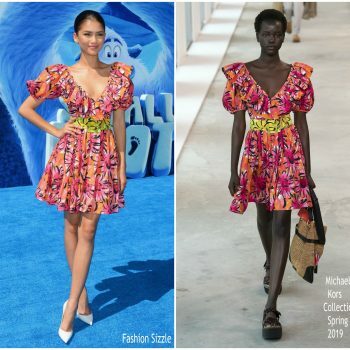 Zendaya Coleman attended Nickelodeon’s 2018 Kids’ Choice Awards on Saturday (March 24) in Inglewood, California She wore a custom Off-White dress styled with a pair of Casadei platform heels, and Yeprem jewelry. Zendaya Coleman attends the 90th Annual Academy Awards at Hollywood &amp; Highland Center on March 4, 2018 in Hollywood, California. 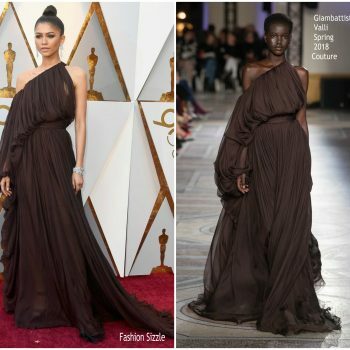 She is wearing a chocolate-brown Giambattista Valli Spring 2018 Couture gown. 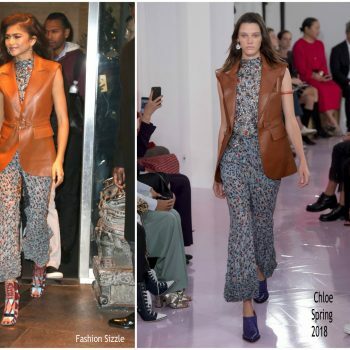 Zendaya Coleman promoted The Greatest Showman in New York She is wearing a Chloé Spring 2018 jumpsuit and leather vest. 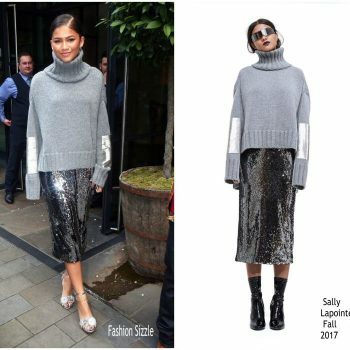 She styled her look with a pair of Sergio Rossi Fall 2017 graphic boots. 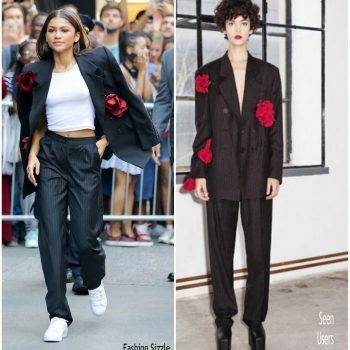 Zendaya Coleman made a guest appearance on The Tonight Show Starring Jimmy Fallon December 11 2017 She wore a Fausto Puglisi Fall 2017 black dress with red piping, crisscross detail & feather embroidery. 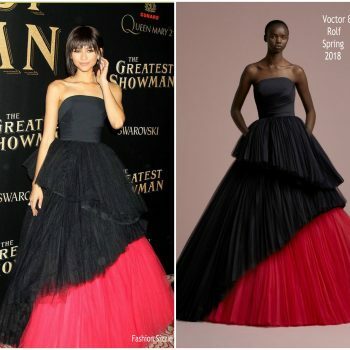 Zendaya Coleman, was spotted promoting ‘The Greatest Showman’ out in New York. 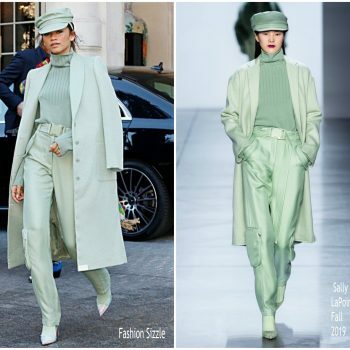 She wore a green Marni Pre-Fall 2017 coat styled with a pair of Casadei boots. 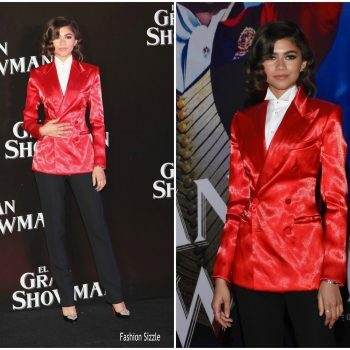 Zendaya promoted The Greatest Showman on The Today Show on Monday morning (December 11) while doing press in New York City. 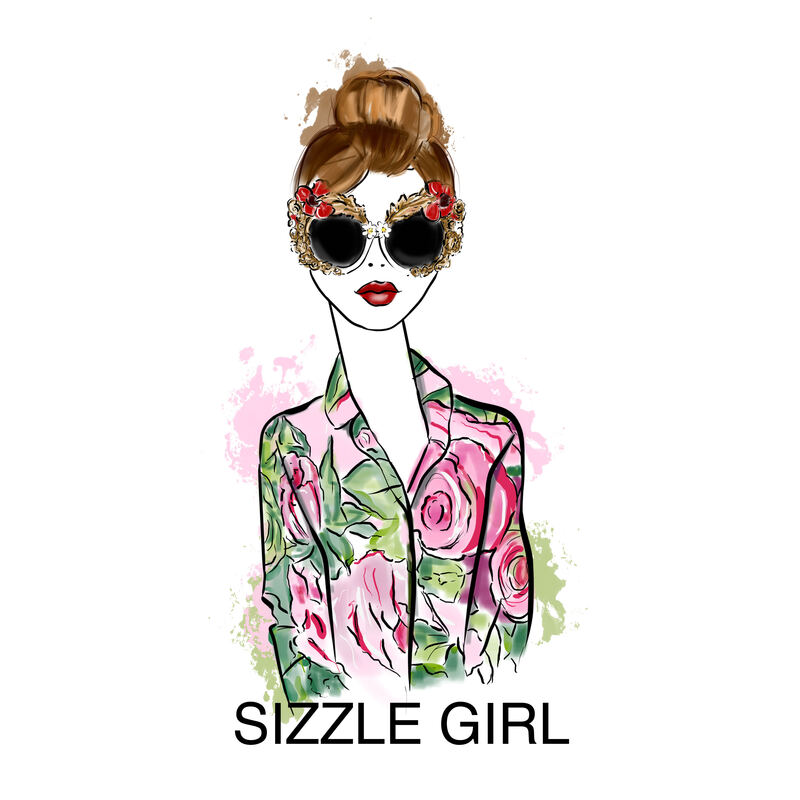 She is wearing a s wearing a Giuseppe Di Morabito’s spring 2017 gold trench coat dress. 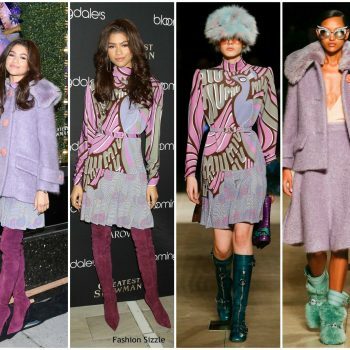 Zendaya Coleman was spotted on Wednesday (December 6) in London England with sizzling looks . 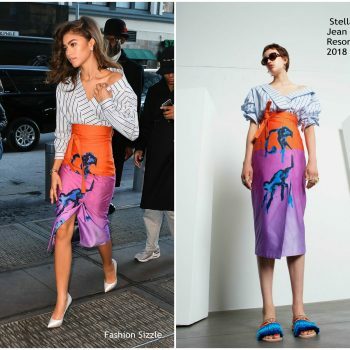 She is wearing a Stella Jean Spring 2018 styled with Vita Fede earrings and Le Silla heels. 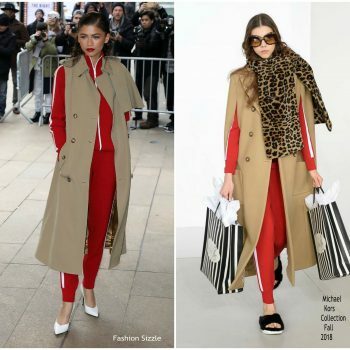 Zendaya Coleman was spotted on Wednesday (December 6) in London England with sizzling looks . 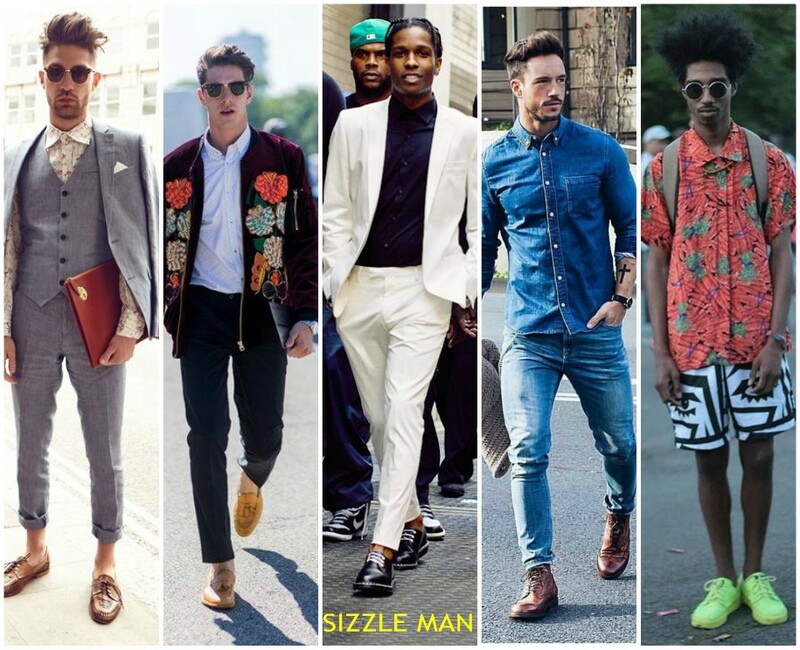 This Fashion Sizzler is wearing a suit by Ronald Van Der Kemp Spring 217 Couture. 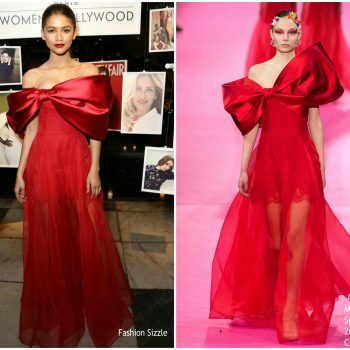 Zendaya Coleman attended the 2017 The Fashion Awards on Monday (December 4) in London. 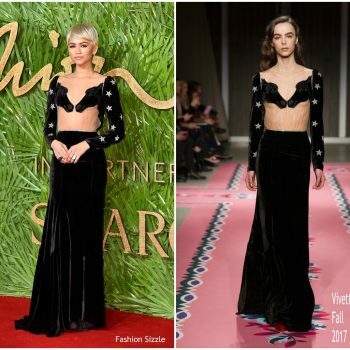 She wore a black velvet Vivetta Fall 2017 gown with Swarovski star details along with a blond pixie wig. 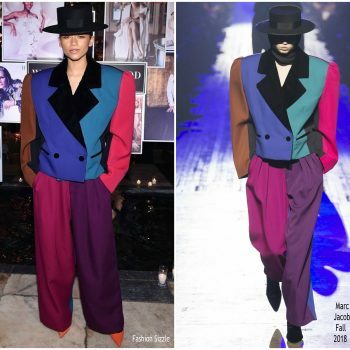 Zendaya Coleman attended the event for Louis Vuitton ‘Volez, Voguez, Voyagez ‘ exhibition opening on Thursday (October 26) in New York City. 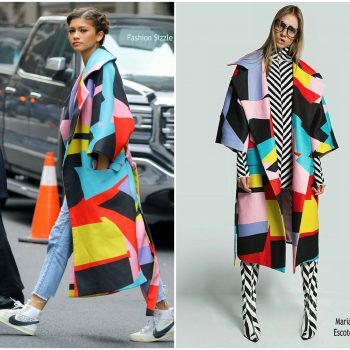 Zendaya Coleman is wearing a Louis Vuitton Spring 2018 design. 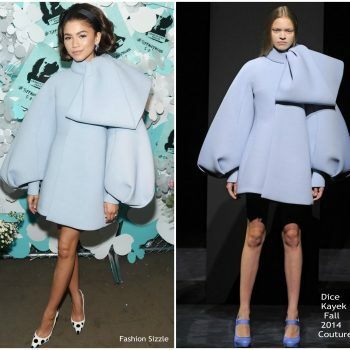 Zendaya Coleman was in attendance at the Forevermark Tribute event on Tuesday (November 7) in New York City. 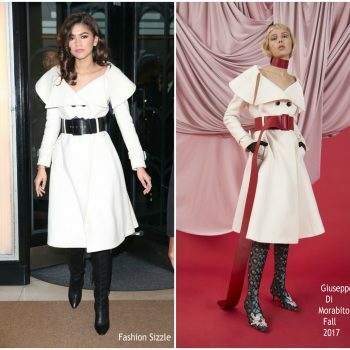 She wore a white Giuseppe di Morabito Fall 2017 tulle jumpsuit. 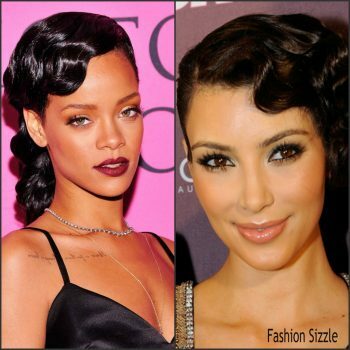 Her look was styled with Forevermark jewery. 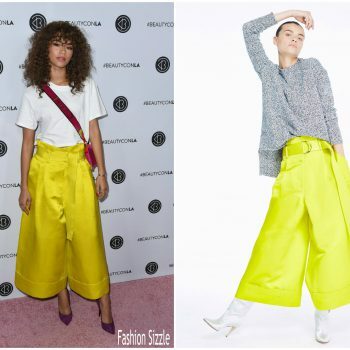 Zendaya Coleman attended the CFDA/Vogue Fashion Fund show at the Chateau Marmont on Wednesday (October 25) in Los Angeles, California. 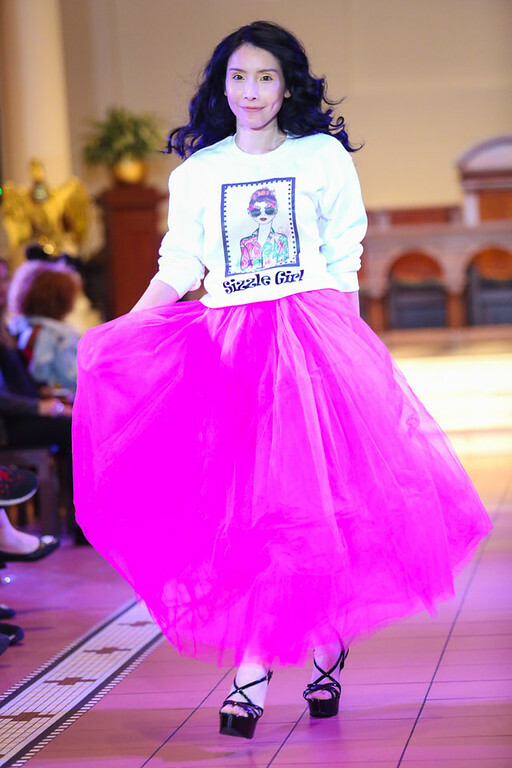 She wore Teresa Helbiga Fall 2016 design. 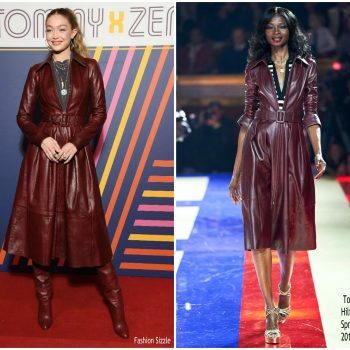 Zendaya Coleman was in attendance along with Kerry Washington at the Women Making History Awards on Saturday (September 16) in Beverly Hills, California. 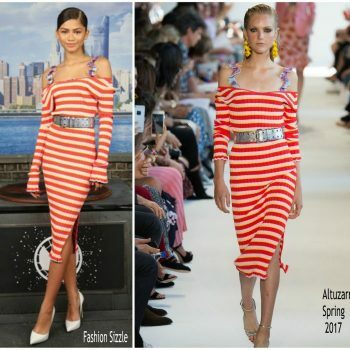 She wore a Christian Siriano Spring 2018 striped design. 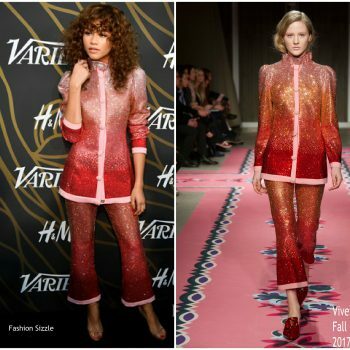 Zendaya Coleman attended the Variety Power of Young Hollywood on Tuesday (August 8) in LA This Fashion Sizzler wore Vivetta Fall 2017 degrade embellished design. 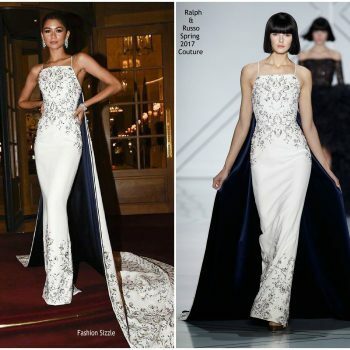 Zendaya Coleman attended the Ralph & Russo’s Fall 2017 Couture show 07/03/2017 She wore a white halter cold shoulder Ralph & Russo Spring 2016 Couture gown. 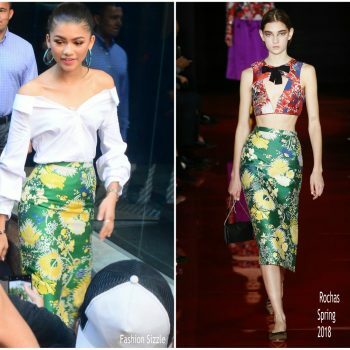 Zendaya attended the Spider-Man: Homecoming’ New York photocall on Sunday (June 25). 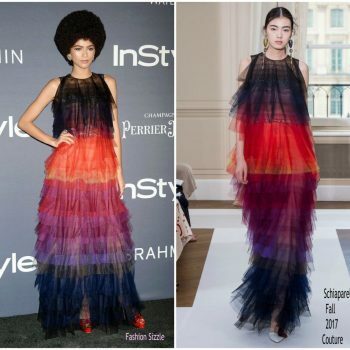 She wore a striped Altuzarra Spring 2017 midi dress. Zendaya Coleman attended the ‘Spider-Man: Homecoming’ Barcelona photocall Sunday (June 18) . 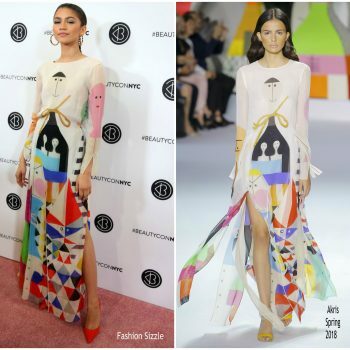 She wore a Delpozo Spring 2015 designs. 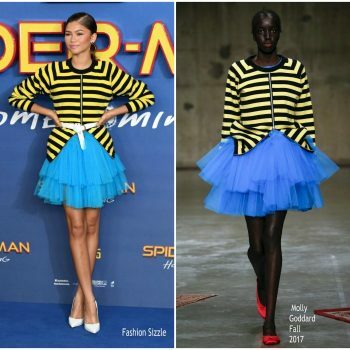 Actress Zendaya Coleman attended 'Spider-Man: Homecoming' photocall at the Villamagna Hotel on June 14, 2017 in Madrid. She wore a light blue Jonathan Simkhai Spring 2017 dress . 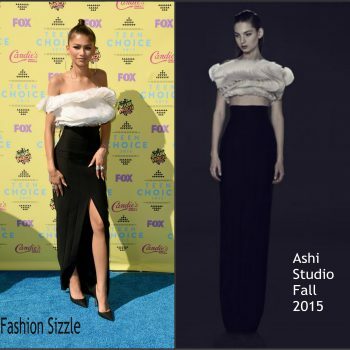 Zendaya Coleman attended the 16th annual Chrysalis Butterfly Ball on Saturday (June 3) in Brentwood, California. 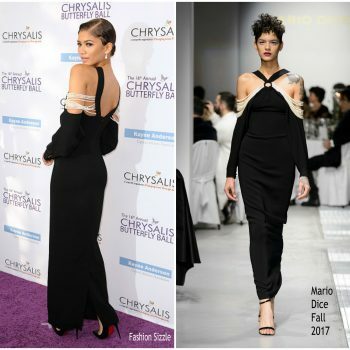 She wore a black and white cold-shoulder Mario Dice Fall 2017 pearl-embellished gown . 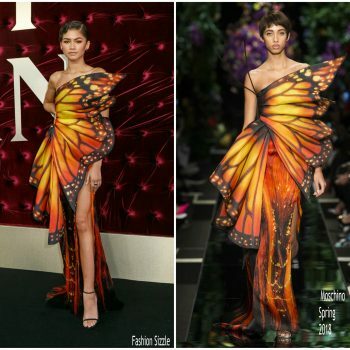 Zendaya Coleman attended the 2016 MET Gala, Manus X Machina-Fashion in an Age of Technology at the Metropolitan Museum of Art in New York on May 2, 2016. 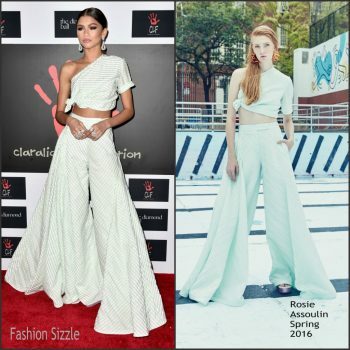 Zendaya was in attendance Glamour Game Changers Lunch on Wednesday April 20 , 2016 at Au Fudge in West Hollywood, California. 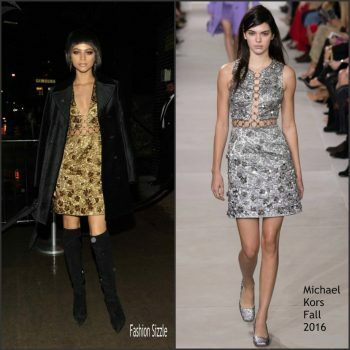 Zendaya wore a Kaufmanfranco Fall 2015 ivory + heather sequined dress as a guest judge on Dancing with the stars Disney Night. 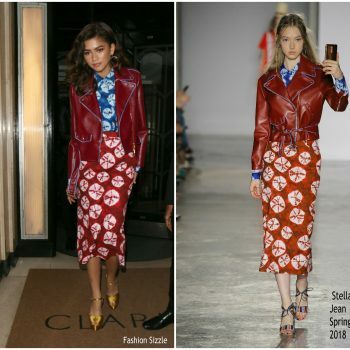 Zendaya was in attendance at Marie Clair " Fresh Faces ' Party in Los Angeles on April 11, 2016. 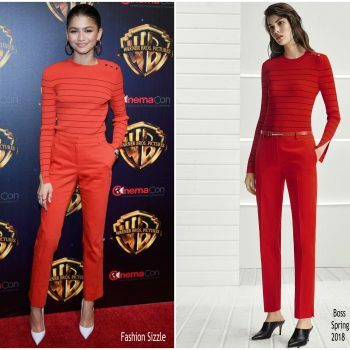 Zendaya Coleman' attended the 2016 iHeart Radio Music Awards in LA. at the The Forum on April 3, 2016 in Inglewood, California.